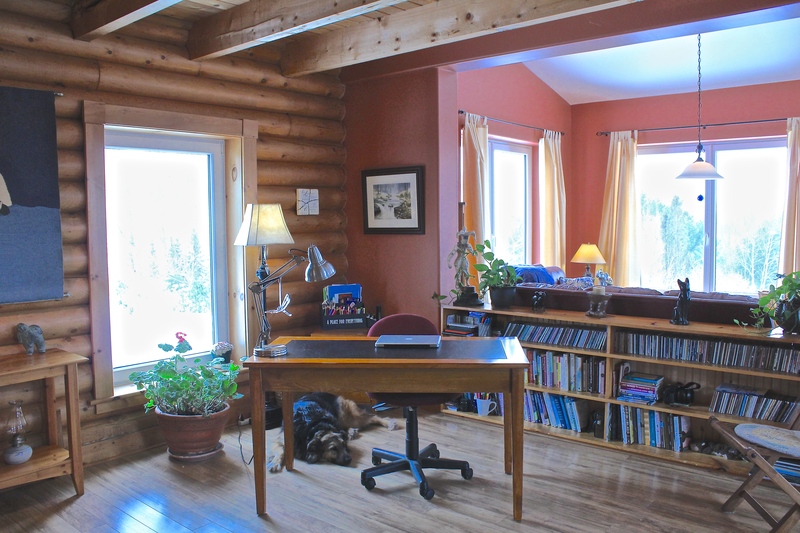 I’m sitting at my desk in the corner of our open-concept main floor at home, letting my eyes scan the room. 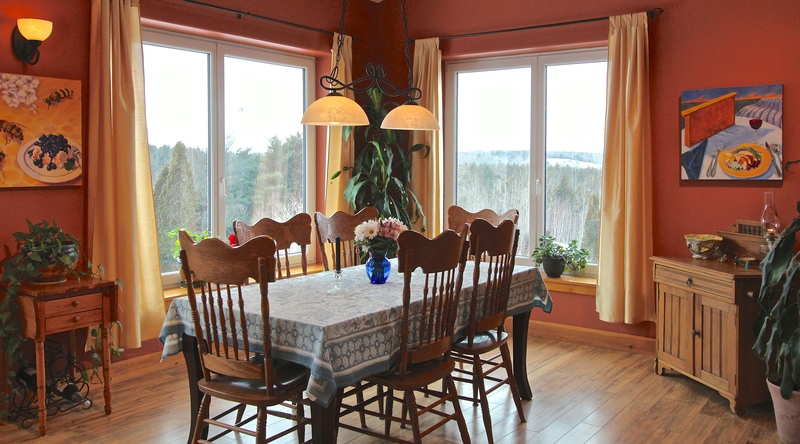 I have a view of just about everything on this floor except the bathroom around the corner, and the end of the kitchen island, stove, and sink which are on the other side of the big central chimney and wood stove. I have a view of the entrance door, the staircase to our bedroom and loft, half of the kitchen and hallway, a little sitting area near the patio doors to the deck, the dining area (can’t really call it a “room” without walls in between), and the living area/sofa etc. And were it still daylight, I’d have views of the treed countryside to the north and west, and garden to the south, though big, bright windows. From this corner I have sat and written and read and pondered and Face-booked and coached and doodled and edited photos, for almost 6 years since we built the addition that expanded this space. Before that I worked from a room in the smaller addition on the east side of the house that was built three years earlier to house my photography gallery and studio, and which is now my husband’s massage clinic. As I look around in the silence of the evening, hearing just a slight crackle from the waning fire in the wood stove and some clickety-clicks from Edward’s keyboard in his office, I have a kind of unease in my belly and my chest, stemming, I think, from a weird new sense of un-familiarity with this place. The same furniture is still here, the same paint colour, the same rustic logs and wood panelling, the same art remains hanging where it’s been for years. A couple things have changed, some external, some internal. It’s not just the shine on the refinished staircase that we’ve finally dealt with after 12 years in this house, though that’s part of it. The whole place has been significantly de-cluttered and polished over the past two-and-a-half months. It’s cleaner and shinier than I’ve ever seen it. Scratches have been touched up, some woodwork has been re-sanded and finished. The kitchen counter has been cleared off but for a few necessary items. Books on the once-crowded shelves have been pared down to create a sense of spaciousness. There is of course the lingering absence in our house and hearts of dear Angus Dog and Jack the Cat, who both left this earth before Christmas. And certainly there is less fur and such to clean up after. But that’s not it. We’ve been cleaning-up, refinishing, even renovating the bathrooms, as well as decluttering and purging possessions, in order to list our house for sale. Yes, we are selling We Are One Farm. As guides to selling one’s home advise, we have “de-personalized” it a little by packing up family photos. We could have gone further, could have painted the terra cotta dining room taupe or some other “neutral,” and hidden some of our art, or our bits of “woowoo” paraphernalia, like the too many Buddhas, singing bowls, and crystals, and my feng shui “cures” like the money frog and bamboo flute chimes, placed here and there, but I’m willing to take the risk that they won’t be off-putting to someone of a different mindset. We’ve done a good job of purging, and we’re still not finished. A few things are stuffed in a rented storage locker for now, things we thought we’d still need later. But I am starting to wonder…if we don’t need them now, will we ever? We’ve given building supplies from the workshop to a friend who can use them; some of my fine art photos and odds and ends to my nieces; household goods and books to the hospital charity shop; sold a few flea-markety items online; gave away my late mother’s vintage dresses, dad’s top hat, and my wetsuit to a local theatre group for costumes. Put my vest and robe and “tabs” from my former barrister’s uniform, which I’d dragged along with me on several moves since I left the practice in 1991, in the kitchen garbage. I was too busy to have a ceremonial fire for it. The attachment was long gone. Edward has trucked all sort of useless remains from construction and garden projects to the dump and recyclers. Old car and tractor tires have been recycled through tire shops. Old built-ins that we’d torn out of this house during earlier renovations we offered up to the magic of the roadside vortex. What was put out in the morning had vanished by evening. A miracle. I have thrown out hundreds of old slides and prints, and various old file folders of taxes, bank statements, early writing submissions, and more. I gave away hundreds of dollars worth of darkroom tools and accessories to a grandmother whose son was teaching his own boy how to take pinhole photos and planned to build a darkroom. I still have thousands of old slides and negatives to deal with, but that will have to be a gradual project. 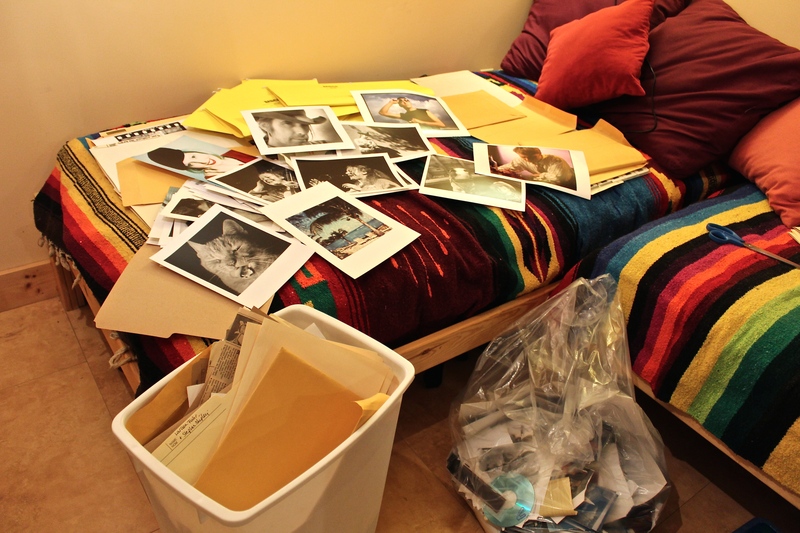 A big box of images even got shipped across the country to my ex-husband. Sometimes it takes a long time to deal with our “stuff”. I still need to have a big sale of some of my remaining fine art photos, and I’d love to find a home (in return for some cash) for my studio lighting gear from a few years ago. Then last week, perhaps one of the hardest parts of the Big Letting-Go of 2017, we re-homed our flock of 11 hens and our gentle rooster, Baby Roo, (who’s not a baby anymore). A sweet young family was kind enough to take most of them to add to their flock, and placed Roo and a couple of his girls with another friend of theirs. They are in good hands, for which we are most grateful, considering they are no longer spring chickens. There were more than a few tears shed by both Edward and me over that good-bye. We’d had chickens for over 8 years and a daily routine had developed around them. Edward and Alfie Dog (and formerly Angus too) would stroll down to the coop first thing each morning, to water and feed them, and let them out to forage, weather permitting. And then the dogs and I would stop by to collect any eggs on our way back from our daily walk in the woods later in the day. And then one or other of us would shut them in at dusk, often stopping outside to appreciate the sunset at the end of another beautiful day. I would occasionally try to herd a wayward girl or two into the coop to speed things up, often a futile effort of playing silly beggars ‘round and ‘round the shed. Edward knew enough to just calmly wait ’til dark if they weren’t cooperating earlier. 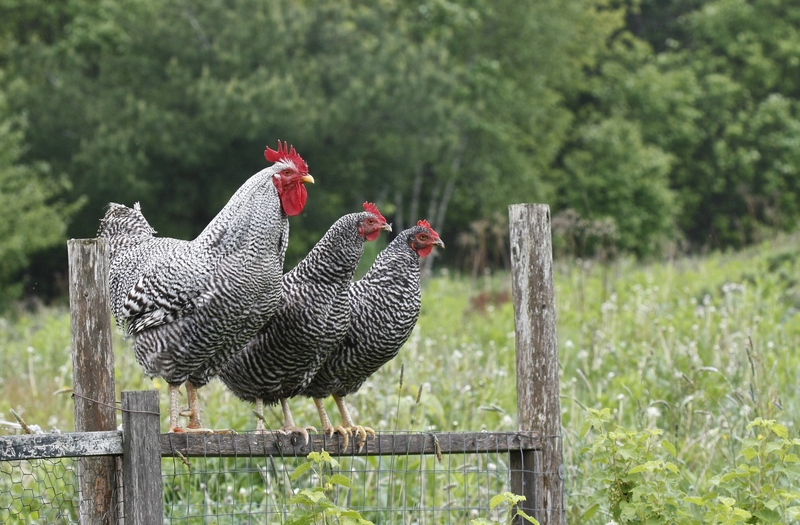 There was a distinctive sense of life force in having a flock of chickens free-ranging on the lawn most days, doing their little two-step and bow, while scratching in the soil for grubs. And there was a jarring stillness outside in the days following delivery to their gentle new homestead down the shore. Something was definitely missing. IS missing. And inside our house a sense of life force also seems strangely missing, in spite of still having Alfie and three cats and numerous plants occupying the space with us. In order to “stage” the house for potential buyers to view, which has just commenced with our listing this past week, not only have we de-personalized by packing away family photos, but we also make sure all towels are clean and white, desks cleared off, counter tops cleared, toothbrushes and personal effects in the vanity out of sight. Our bathrooms and bedrooms look like they are in a B&B. The whole house does, but perhaps even more sparsely appointed. For a viewing we have to vacate the premises (unless Edward has clients in his clinic), and Alfie comes with us, leaving only the cats at home. We try to hide most evidence that a dog even lives here. And there are fresh flowers on the dining table. And even in the bathroom. Who does that? People who are trying to sell their houses, that’s who. It’s lovely. But weird, except in summer when they are abundant in my own garden. The only time our house is anywhere near this clean and tidy is when relatives from away come to stay, but even then, they don’t usually get the run of our room upstairs or the basement. There had to be a space to toss stuff out of sight. Not any more, the whole place is on display. We have tried to make this property become somewhere that other people, as yet unknown to us, could imagine themselves living. There is still quite a lot of our own personality expressed here through colour, art, books, and our particular renovation choices. But it is becoming less and less…ours. And then perhaps what has really shifted, besides the departure of the hens and of so much stuff, is the energy. Yep, the energy…of intention. With my having studied feng shui and space-clearing, and Edward being a practitioner of various energy healing techniques, we are pretty attuned to what energies we are creating or projecting through our intention. Not to say we (or is that just I ?) always project what would best serve us (that’s the “royal” us)… but we do both know better. In this case, I have been working very intentionally throughout this purging process to let go of this house and land and “free” it for a new owner. Both Edward and I have done some small ceremonies of sorts to speak our intentions into the world…about releasing our connections to this land and house, releasing our desire to continue living here, and stating our intentions to move on, intending that the right people will find this property soon. And also expressing our deep gratitude for what this place has meant to us. Creating a vision like this important. Making space, not only physically, but emotionally and mentally, for something new to enter our lives, usually requires letting go of something. It seems obvious that one has to sell one place to get another (for most folks), but this letting-go goes deeper. For us to be able to buy our new home we have to really be in a place of releasing the old one in our hearts. 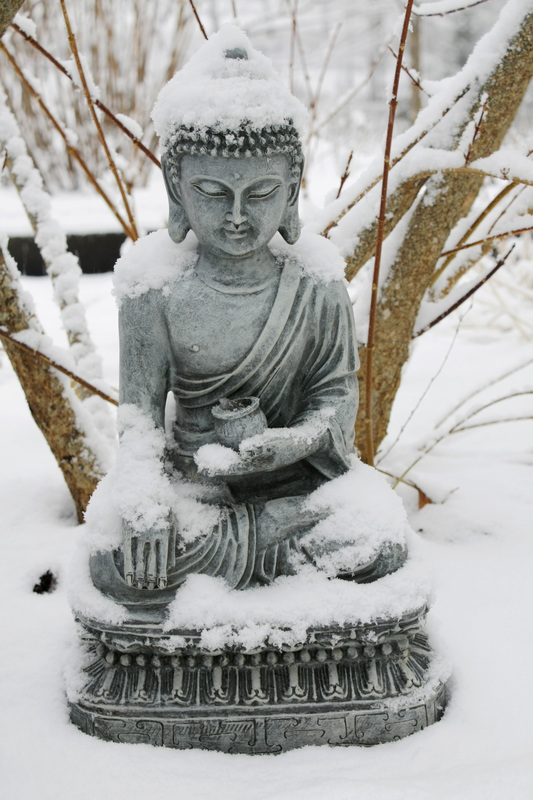 And to attract someone new to come and buy ours, we also have to release our attachment to being here. We have to make space for them to move in. We have tried to intentionally withdraw our energetic connection to this place, to the extensive gardens we have built, rebuilt, and tended over these last 12 years; to the boules court where we have entertained friends with our signature “Provence party” every July filled with food and friendly competition and great conversations; to the patio we built together when I first moved in and where we were later married in 2008 surrounded by an intimate group of friends. There are so many wonderful memories associated with this space. It was on this property I first told Edward I loved him. It is where I adopted my first and second dogs, the first of whom we also sadly buried here last fall. Here is where I learned about shamanism and had the first of many profound experiences that awakened me to a spiritual connection I had not known before. This is where I created my first photographic art gallery, later started practice as a soul coach, life coach, and Reiki practitioner. 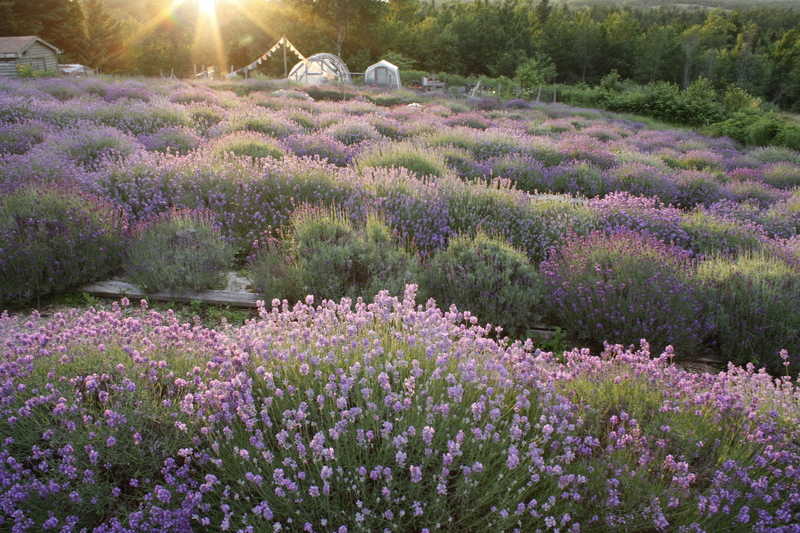 And on a romantic whim, this is the place where I also planted over 500 lavender plants to create my small farm for a while, eventually participating for a couple of summers as a vendor at local farmers’ markets, where I built a lasting connection with some amazing people. This is also the place where I truly connected to the earth and nature, not only developing a passion for gardening, but for appreciating the wonder of the sparkling night sky, the variety of sunsets and clouds, the awareness and joy of watching weather systems approaching and passing by. And this is where I especially learned to appreciate the comforting sanctuary of the trail through our woods with it’s rusty carpet of pine needles, the leathery shades of moist leaves in the fall, the delight in spring wildflowers, and the silent embrace of the tall trees at the back of the land. I even learned to love and appreciate a variety of frogs, toads, and snakes that became like spirit guides from time to time. 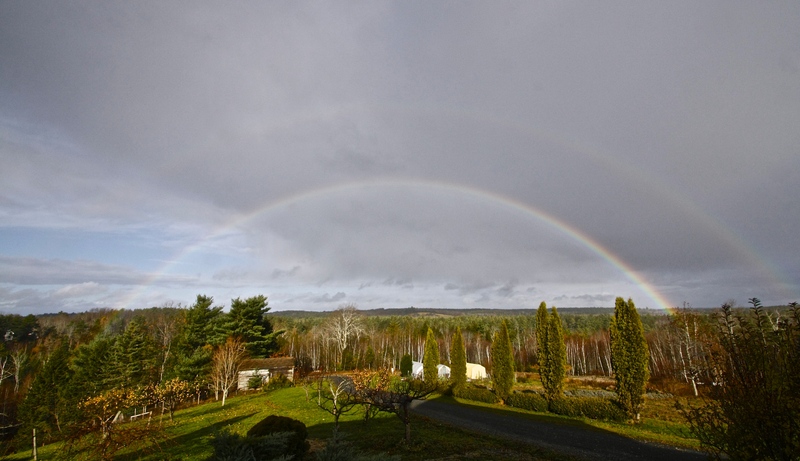 These past 12 years have been a transformative journey for me on this beautiful property, both totally grounding, getting me more in my body than ever, and at the same time, being spiritually uplifted. 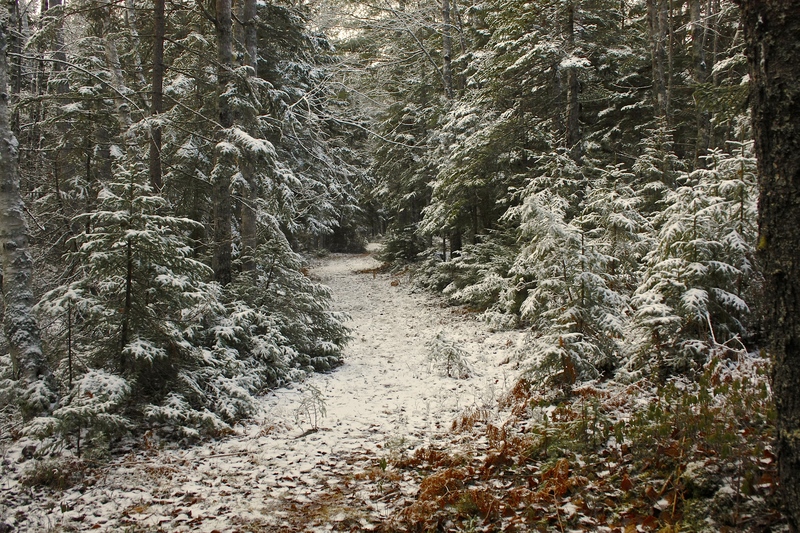 As I have set out to withdraw my energetic attachment here to make space for someone new to take over, and for us to find the new home that we need, I have removed some of the hidden crystals I had placed in my sacred circle, the simple stone medicine wheel where I prayed and quested at the end of the woods trail. I also removed some of the special stones and crystals from the rock labyrinth we made last summer. This won’t change it for anyone else but me as it is more symbolic than anything. Crystals or no crystals, there is still much magic to be experienced here. It is all about intention in the end. As I finish this post we have just received news that the folks who had viewed our home on the weekend will be back for a second look in the morning, with a chance for a warmer walk through the woods, weather permitting. We’ve decided to grab a bite in town rather than disturb my pristine kitchen both this evening and in the morning. I had to open the windows on this cold day to remove evidence of the fried sausages Edward cooked for breakfast. I understand that real estate purchasers are highly conscious of smells. We are in that place of in-between. The property is still ours on paper, but whether the folks tomorrow make an offer or not, energetically this no longer feels like our home. The unfamiliarity I wrote about at the beginning is that sense that we don’t really own this anymore. We’ve lost the freedom to mess it up. We no longer view it with our own eyes but attempt to see it with the eyes of a potential purchaser, scrutinizing details that we were able to live with for years but lately have repaired or renovated judging it otherwise unsuitable for others. When I walk Alfie to the back of the trail now I no longer feel like lingering to pray or just observe. I sobbed big, deep sobs from my belly a few weeks ago in the sacred circle when I retrieved my crystals, the reality of the shift catching me off guard. This is not “ours” anymore…. if it ever was. Edward always called us “stewards” of the land. I guess he already understood that it it is all a temporary state of being, and nothing is ever truly owned. I expect I’m not quite done with the tears, but in this state of in-between-ness, I am getting anxious to go. ← A dog, death, and dragonflies. This a very powerful & moving piece of writing. I was amazed at all the firsts you have experienced in this home that you and Edward had created for yourselves with your own sweat and tears of love, loss, and labour. It is very emotional as well as I felt your pain when retrieving the crystals from your garden and with the loss of your animal friends. It is also very enlightening on how to be free with an understanding of stewardship. It speaks volumes about simplicity, patience, and compassion. Thank you for sharing your personal thoughts with us. I’m sure I can speak for some of us who can honestly say that we understand your emotions and feel some of the pain and emptiness that you are experiencing as you live in this phase of limbo. Thank you so much for your thoughtful comments. I really appreciate this. I wonder if it is the power of this place or just the age when I landed here that offered so much opportunity for all those firsts (I was 45). I approach the next phase with excitement but also trepidation as the home we are contemplating would be such a total shift..almost NO and, smaller windows…lovely but more cave-like in comparison to the big light and sweeping views. No eagles to watch fly by. Will creat many new shifts I am sure. Thanks again. Will be interesting to see what develops. Ah that sounds nice Esther, but if we get the place we’ve looked at, there is absolutely NO room on the south or east side. Literally! And very little on the other sides for any addition. We’ll have to accommodate my need for light and space by simply getting out and on the street or in the parks or going for drives to other places to walk. And I think we envision simply more community engagement.